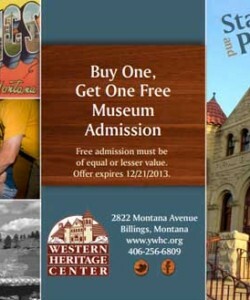 BOGO Coupon for the Montana Museum. Get free admission when you buy one get one coupon today! The Western Heritage Center in Montana is full of rich culture and experiences fun for the whole family and especially educational. 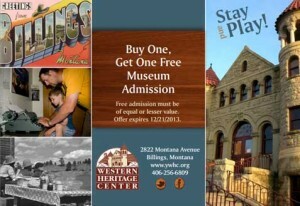 Learn about our history, our heritage and western culture in Montana. Buy One Get One Free Admission to the Museum and enjoy your family outing today. It’s always great to save on admission to family museums and teach your children about their history all at the same time. Take the time to head on over to the Western Heritage Center Museum in Montana and Save with this BOGO admission coupon today!